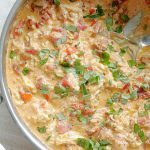 These Slow Cooker Italian Chicken Sandwiches have a fresh tomato flavor even when tomatoes aren’t in season. Slow cooked Italian-flavored chicken is piled high on toasty garlic bread with melted Provolone cheese and fresh chopped basil. I think I was on strike from fixing chicken for dinner for a while. I’ve been finding all kinds of inspiration for chicken dinners on Pinterest lately though and my family’s current favorite dinner is Chicken Burrito Bowls so I think it’s safe to say that my strike is over. 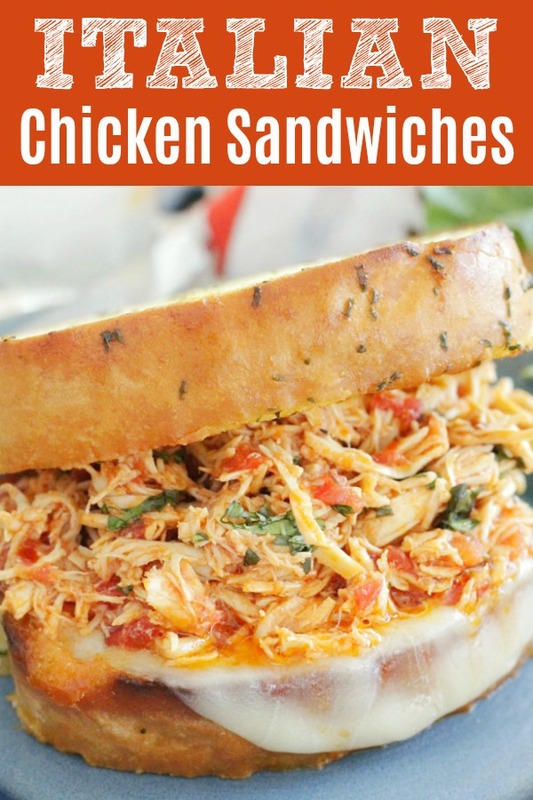 For sure these Slow Cooker Italian Chicken Sandwiches will be making a repeat performance on our dinner table – and not just in the colder months. Speaking of cold our Springtime here in Ohio seems to be one false start after another. As I type this post I’m wearing a fleece jacket and snuggled up under a fuzzy blanket on a cold morning… in April. It’s not that I’m complaining necessarily because I’m really not a fan of the super hot and humid weather we get during the Summer. The weather is just so weird that it’s throwing me off – like my brain just doesn’t know what to plan for and I’m having a hard time adjusting. Anyway the plan for these chicken sandwiches at least worked. They turned out better than I could have ever possibly hoped, actually. I don’t know if I was just craving a good sandwich but these really hit the spot. 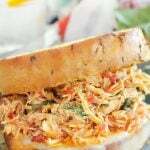 The fresh basil stirred into the chicken right before serving is the “secret” ingredient to these scrumptious sandwiches. 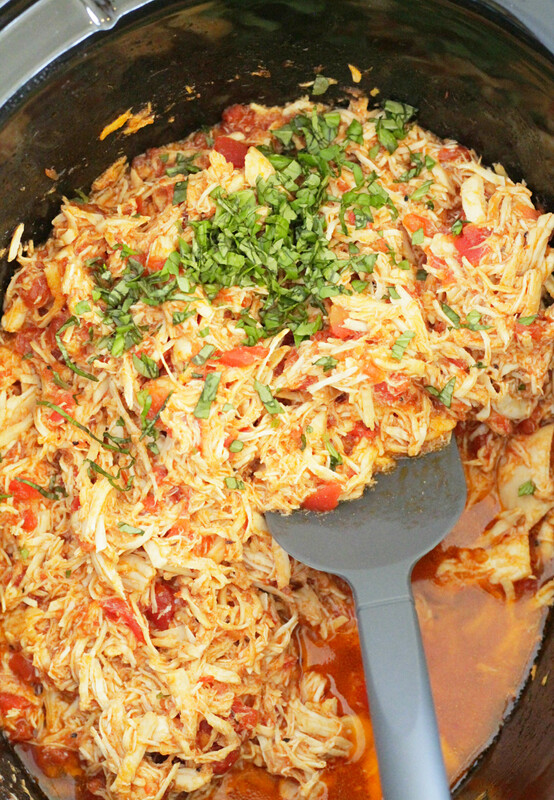 For slow cooked chicken I was really surprised by how truly lively and bright the taste is! 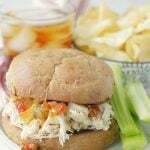 These Slow Cooker Italian Chicken Sandwiches have a fresh tomato flavor even when tomatoes aren't in season. 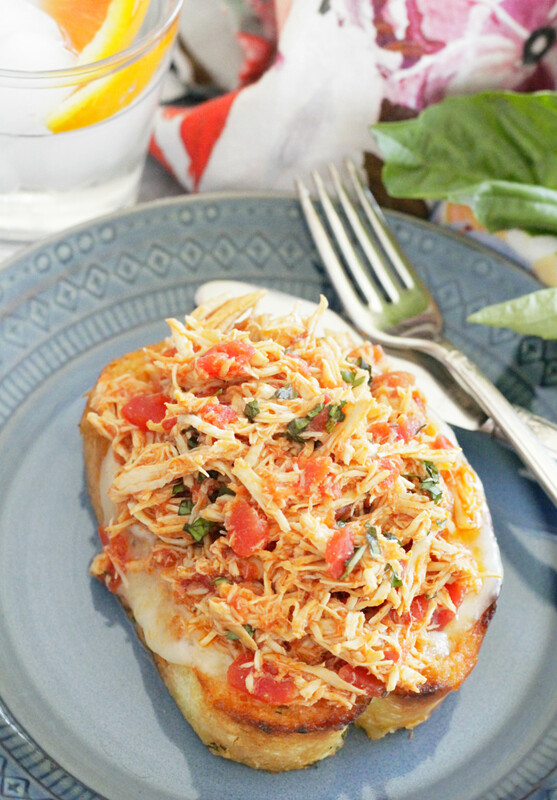 Slow cooked Italian-flavored chicken is piled high on toasty garlic bread with melted Provolone cheese and fresh chopped basil. Place the chicken breasts in a 6-quart slow cooker. Pour the drained tomatoes on top of the chicken. In a small bowl, whisk together the Italian dressing, tomato paste, sugar, salt and red pepper flakes. Pour the mixture over the chicken and tomatoes. Put the lid on and cook on LOW for 6 hours. Shred the chicken and turn the slow cooker to WARM. Bake the garlic bread according to package directions. Place one piece of provolone cheese on each of four slices of bread during the last minute of baking time so the cheese can melt. Stir the fresh chopped basil into the shredded Italian chicken. Pile the chicken on top of the cheesy garlic bread slices. Top with the remaining garlic bread slices to make four sandwiches and serve. OMG what a great idea to use garlic bread for a sammy. My kids gobble that stuff up like nobody’s business. The chicken looks super tender and I’m sure this baby is packed with flavor. Comfort food!! The chicken is so tender – I hope you try them! This sandwich looks and sounds so delicious! I love slow cooked chicken! It will be great on this sandwich! This looks super delish and I can’t wait to try it out! Just pinned…and I know it’s gonna be a hit. Thanks for the recipe inspiration! You’re welcome and thank you so much for the pin! One of the best sandwich that I have seen so far. Love the recipe. Saving it for later. I’m flattered – thank you! This looks and sounds SO good. You see so many recipe like this that are BBQ-centric, and that’s cool and all, but I’m love the Italian flare here. 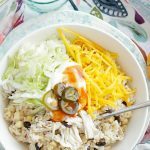 I’m loving all those flavors with the chicken and the fact that it’s made in the slow cooker. Definitely need to make this recipe! Love that you use garlic bread here!! Absolutely delicious!! My family would go crazy if I made this with my delicious garlic toasts made with my sourdough bread! Oooh, garlic toasts with homemade sourdough bread? That sounds amazing! 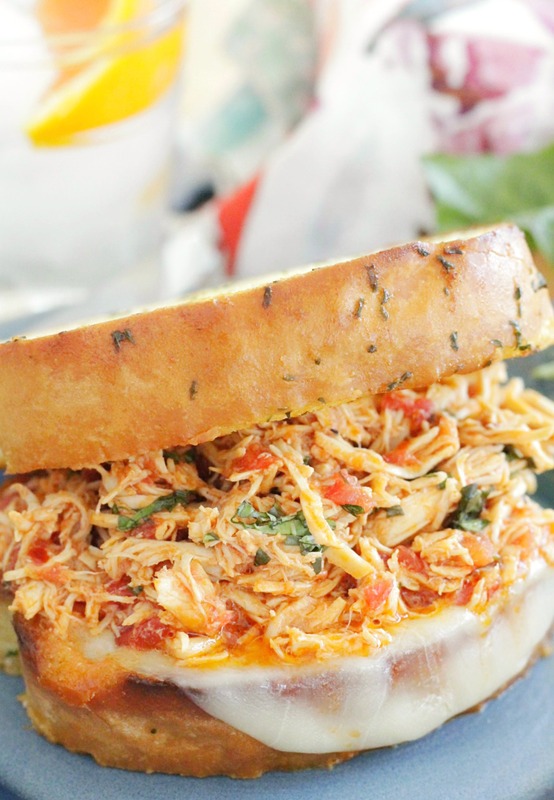 I can not wait to try this Slow Cooker Italian Chicken Sandwiches. It looks very tasty! I love slow cooked chicken! One of the BEST sandwich that I have seen so far. Thank you for sharing this great recipe! YUM! I loooove the sound of this, comfort food made in the slow cooker is my kinda food! Wish I was there when you made these sandwiches! 🙂 They look delicious! Made this today for dinner and OMG!!!! Delicious!!! I mean like absolutely amazing!! The flavors were so great together and the garlic bread just added the icing to the cake!!! I’m so happy to hear this! Thanks so much for leaving the positive review. I appreciate it! Oh wow – this recipe looks amazing! 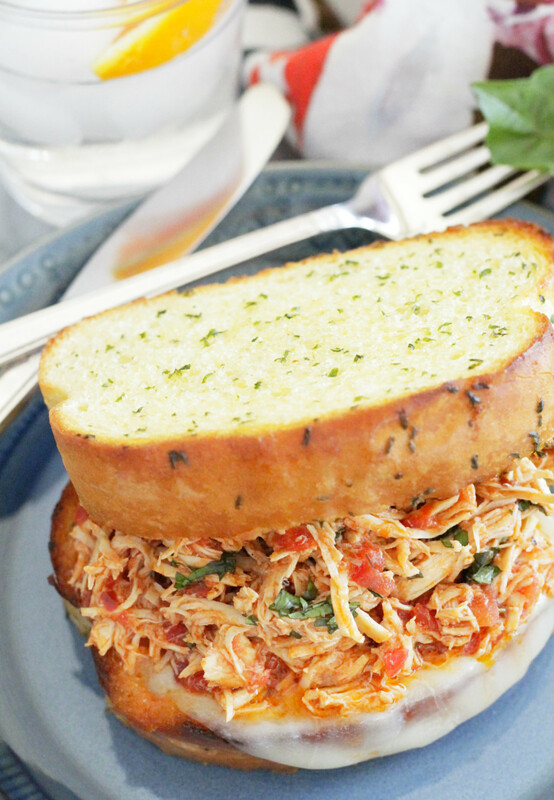 I never would have thought to make an Italian chicken sandwich OR use garlic bread – just brilliant! That looks like a hearty and delicious sandwich. Even better that you can use your slow cooker too. Exactly. So easy with a tasty pay-off! Oh man, this looks so delicious and comforting. I’d like to have it for dinner tonight. I need to go get my slow cooker ready! Yay! Glad you are wanting to make these! This has such amazing flavors and makes for the most perfect lunch! I pit ALOT of red pepper flakes in it by accident. Is it ruined?! Red pepper flakes are pretty strong – very spicy. So it might be, unfortunately. Sorry that happened to you!